RIYADH, Saudi Arabia--(BUSINESS WIRE)--Saudi Arabia plans to build 9 water desalination plants on the Red Sea coastal city of Jeddah, at a total cost of more than SAR 2 billion, said Abdulrahman Alfadley, Minister of Environment, Water and Agriculture. The minister tweeted that the project to build the plants was ordered by King Salman and Crown Prince Mohammed bin Salman. The plants will have a total capacity of 240,000 cubic meters of water per day. The news of the plans came as Saline Water Conversion Corp (SWCC) said it had achieved a historical record in desalination technology that helped increase the production of desalinated water to 5 million cubic meters per day, a global record for the desalination industry. Crown Prince Mohammed bin Salman thanked SWCC for the achievements, as he paid a visit to a desalination plant in Jeddah on Wednesday. 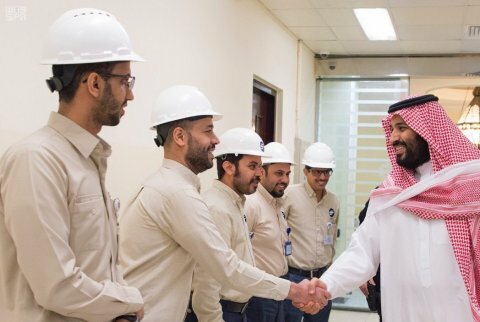 “Increasing the production of desalinated water from 3.5 to 5 million cubic meters per day is a great achievement for Saudi Arabia,” the crown prince said during his tour at the plant. In 2011, the volume of water supplied by the country's 27 desalination plants in 17 locations was 3.3 million m3/day (1.2 billion m3/year). Alfadley said the new plants, to be completed in less than 18 months, will boost production efficiency and cut operating costs for the SWCC, a government corporation. These plants “will have a significant impact on improving the quality and scope of water services, in pursuit of the objectives of the National Transition Program 2020,” he said. Water security is a key challenge for Saudi Arabia, which has invested heavily in seawater desalination, making the Kingdom the world’s largest producer of desalinated water currently. SWCC Governor Ali bin Abdul Rahman Al-Hazmi said that all stations were working at full capacity “according to methodological and scientific foundations” to ensure employee and equipment safety.